The news that's making headlines in the tech world these days is Microsoft's acquisition of professional networking giant Linkedin. And the buzz is not without reason. Microsoft has splashed out a whopping US$ 26.2 bn. The deal is only second in the list of biggest technology M&As of all times. However, if you doubt that Microsoft will have to huff and puff in order to fund the deal, today's chart of the day will certainly put the doubt to rest. 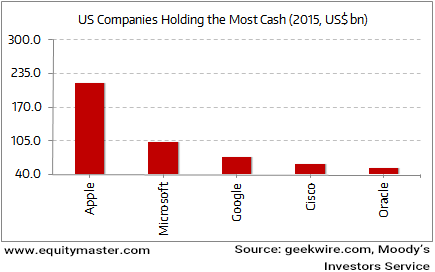 As the chart highlights, at more than US$ 100 billion, Microsoft's cash war chest is behind only Apple's amongst all US companies at the end of 2015. In fact, the list is dominated by tech giants with the multinational pharma giant Pfizer, the first non-tech company at number six. Here's another interesting stat. The top three cash rich US companies hold nearly a quarter of all the cash held by the country's non-financial corporations. Indeed, no better proof than this one, of the observation made by Warren Buffett that the business world is divided into a tiny number of wonderful businesses - well worth investing in at a price - and a large number of bad or mediocre businesses that are not attractive as long term investments. Equitymaster requests your view! Post a comment on "Top US Tech Firms are Swimming in Cash". Click here!